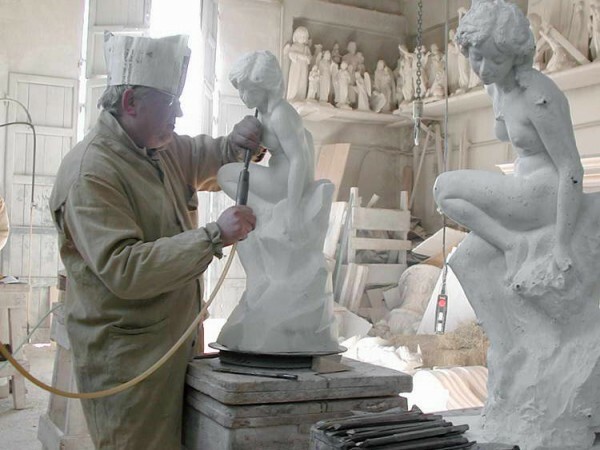 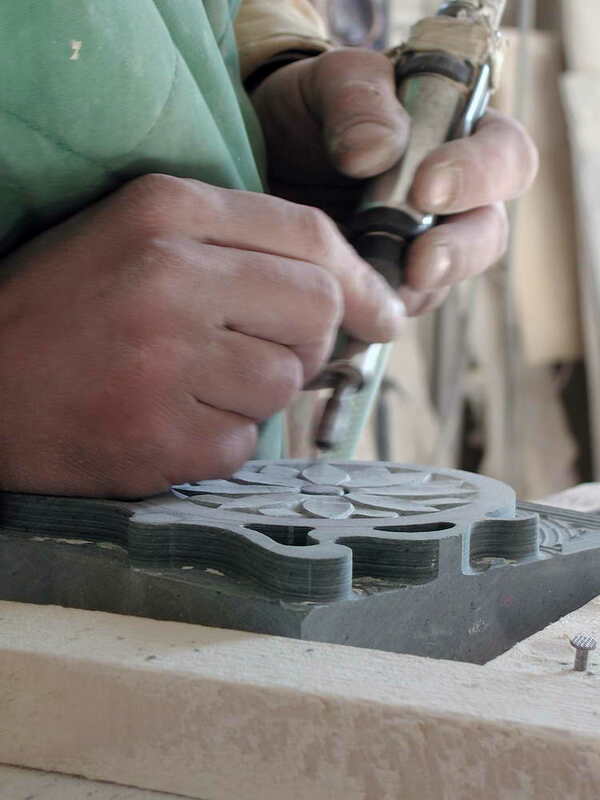 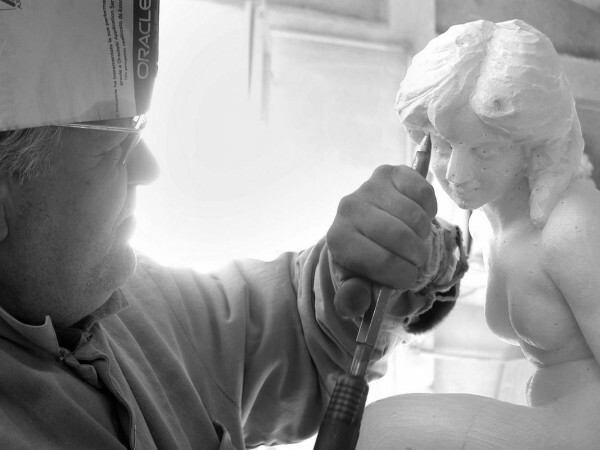 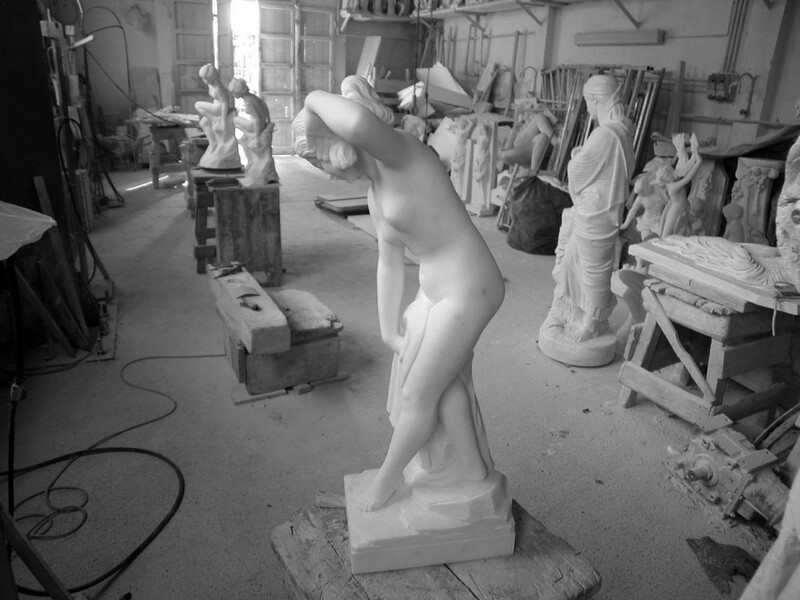 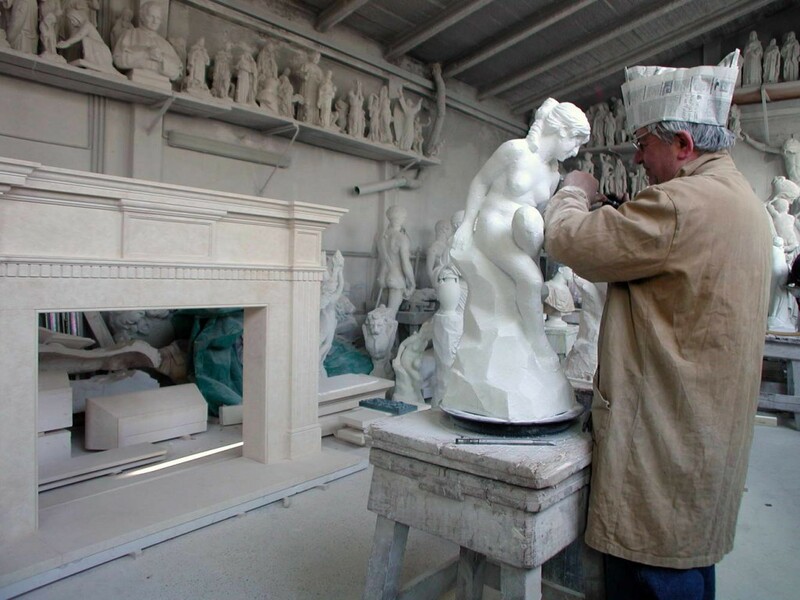 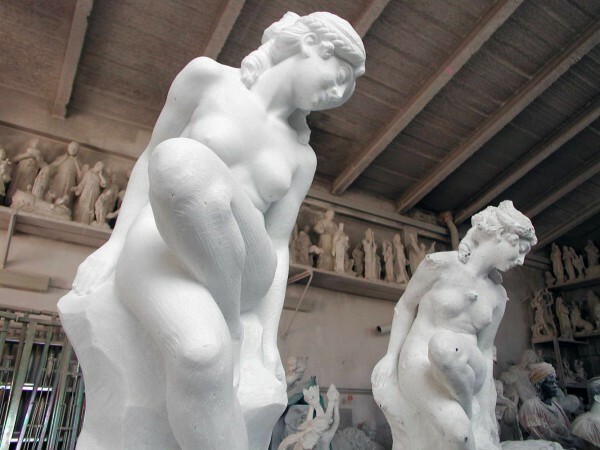 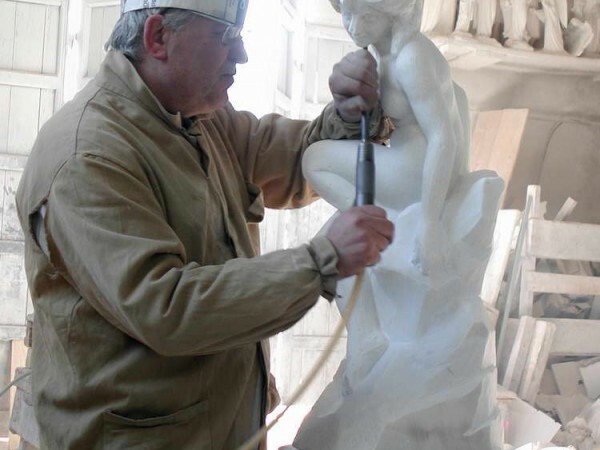 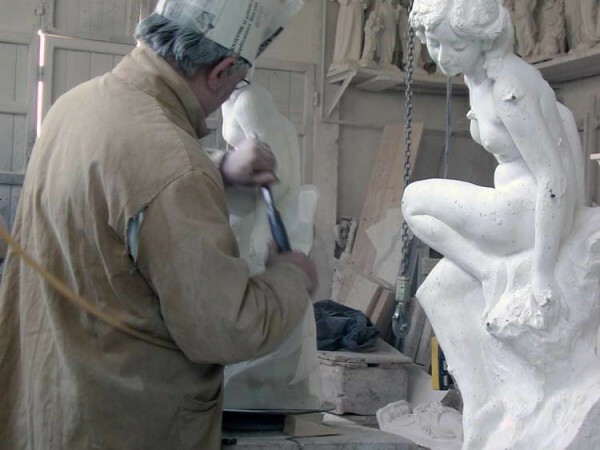 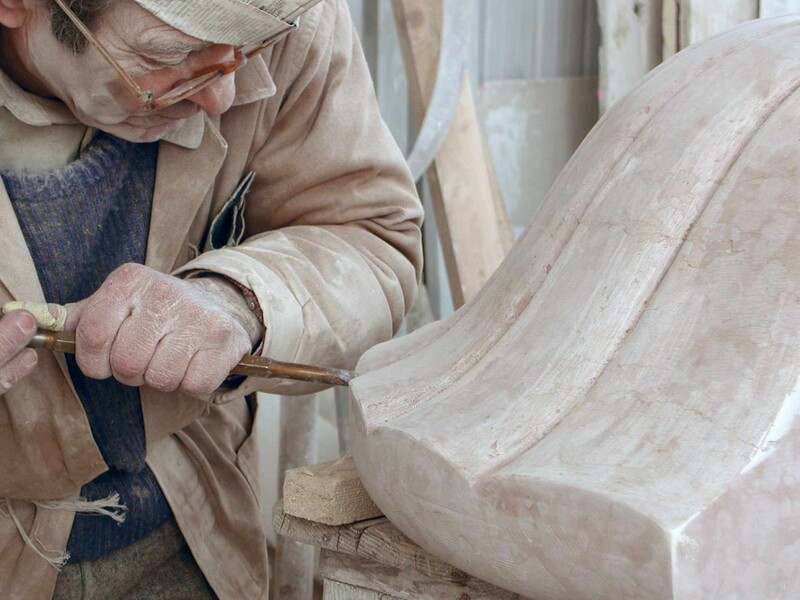 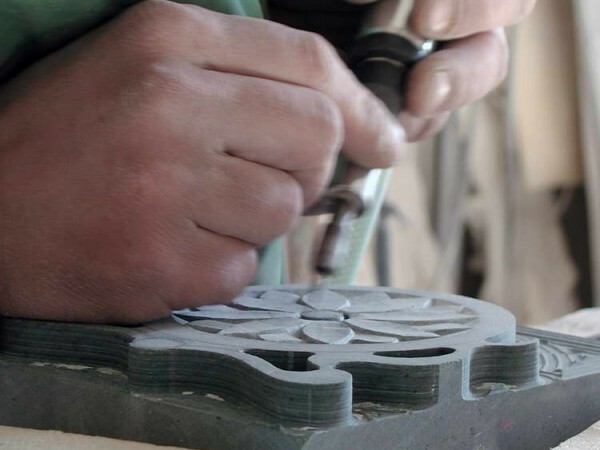 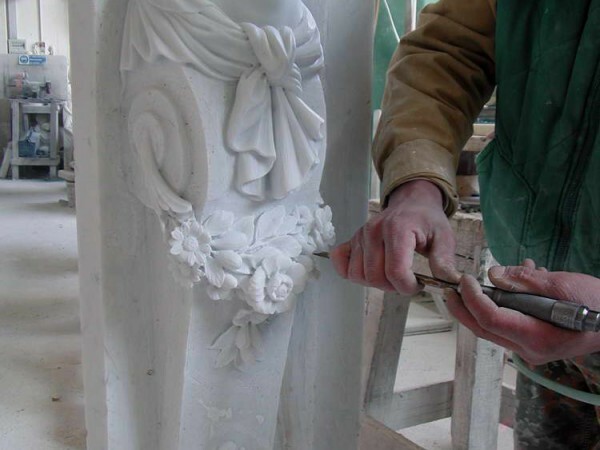 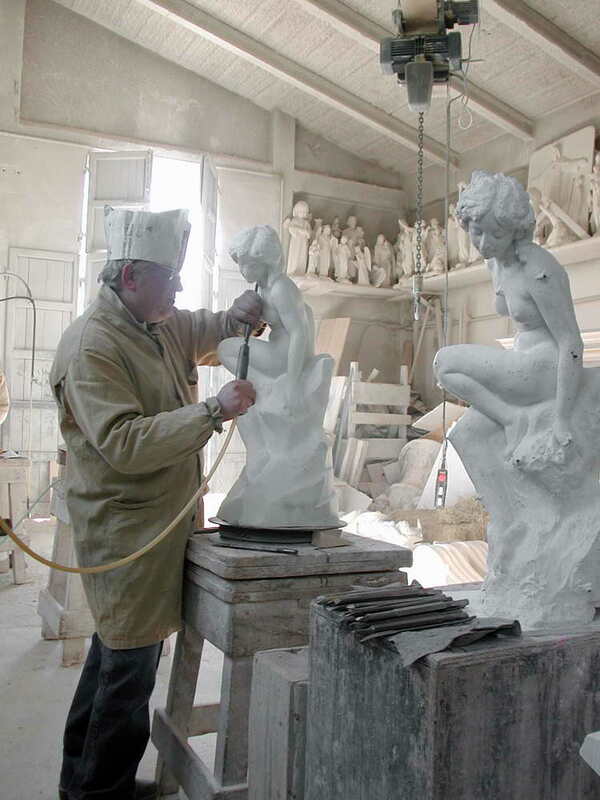 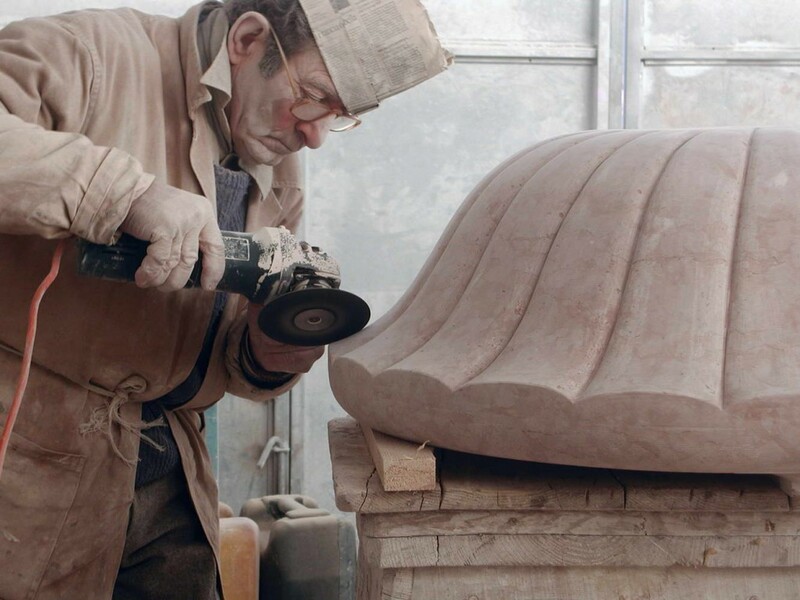 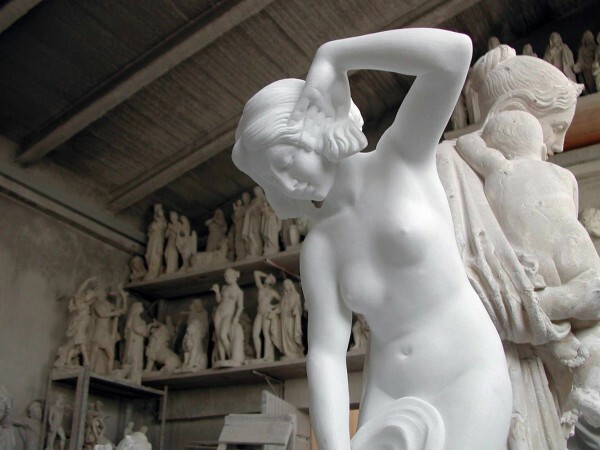 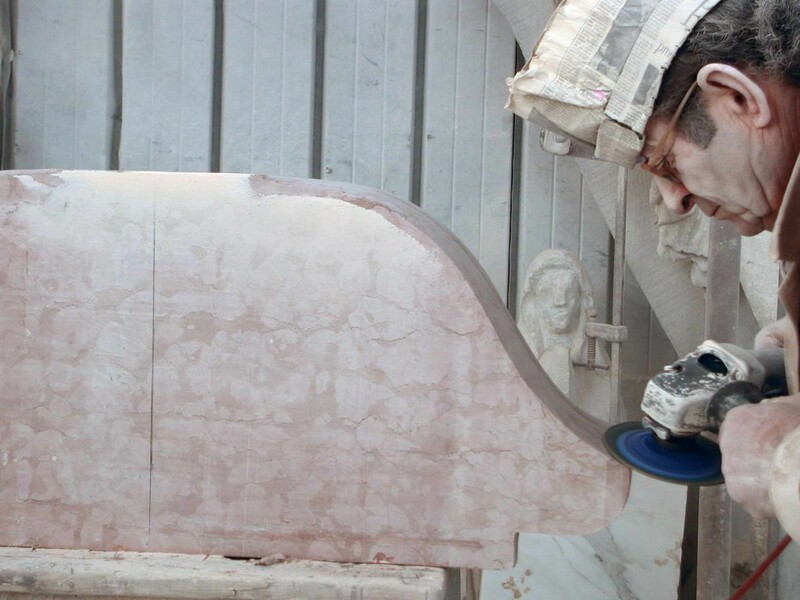 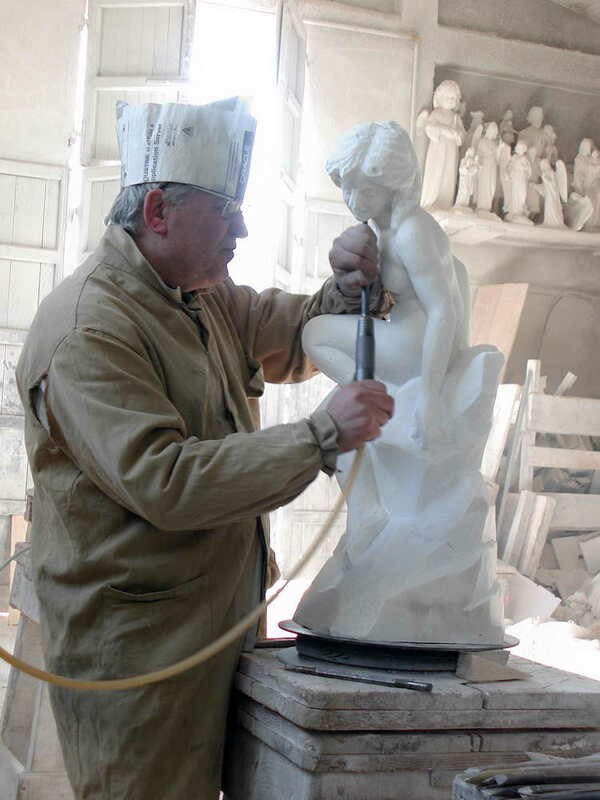 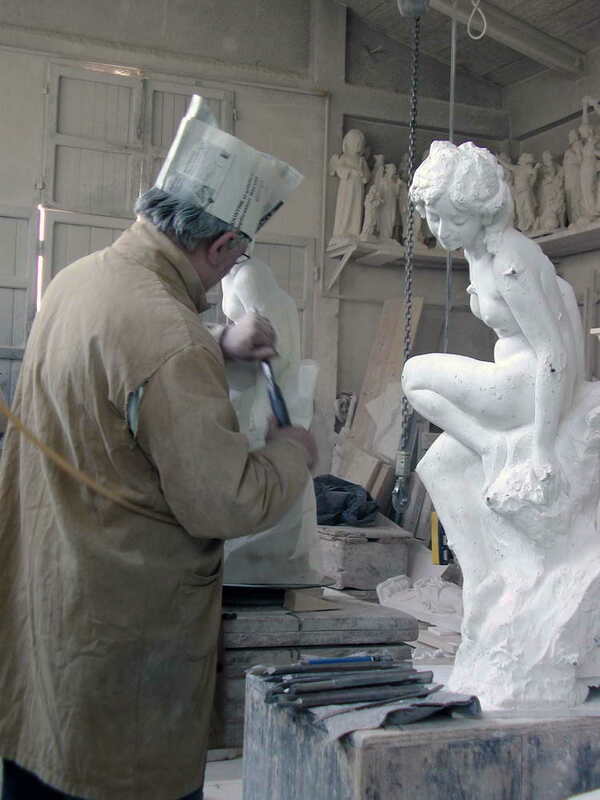 In our workshop you can soak up the atmosphere of sculpture, its ancient history and legacy, where manual skills and machinery confront each other with creativity and knowledge, merging into a passionate blend of artistry that has created wonderful works of extraordinary beauty. 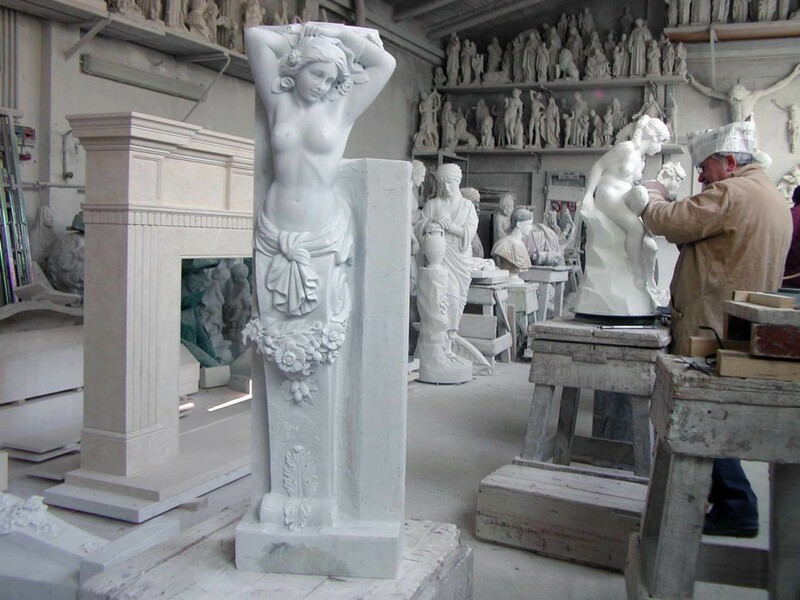 Born from a deep passion for sculpture handed down from a family of marble craftsmen, our workshop has retained the magic atmosphere of the art studio, where each creation comes to life through the carefully carried out expert gestures of this ancient manual craft, using traditional tools, with the sole aid of air compressors to rough out the forms. 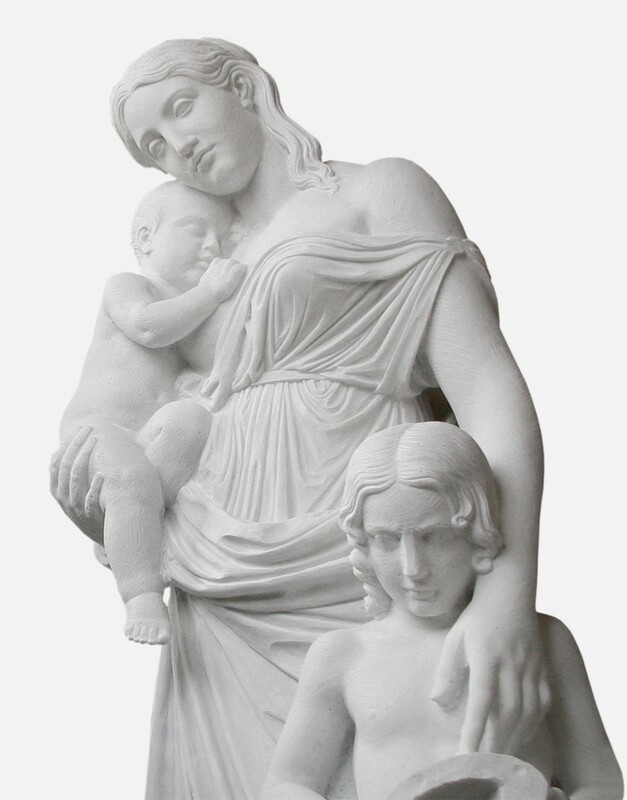 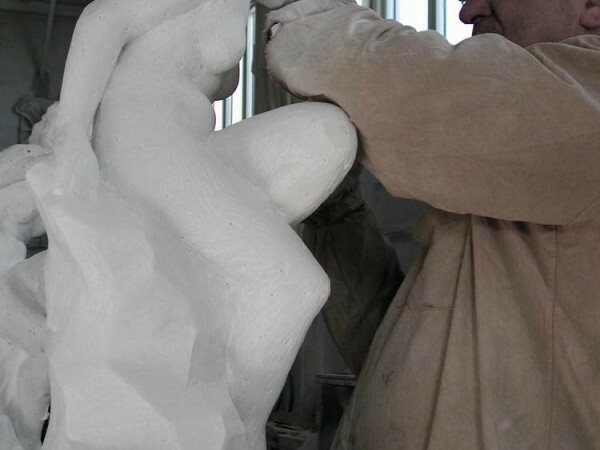 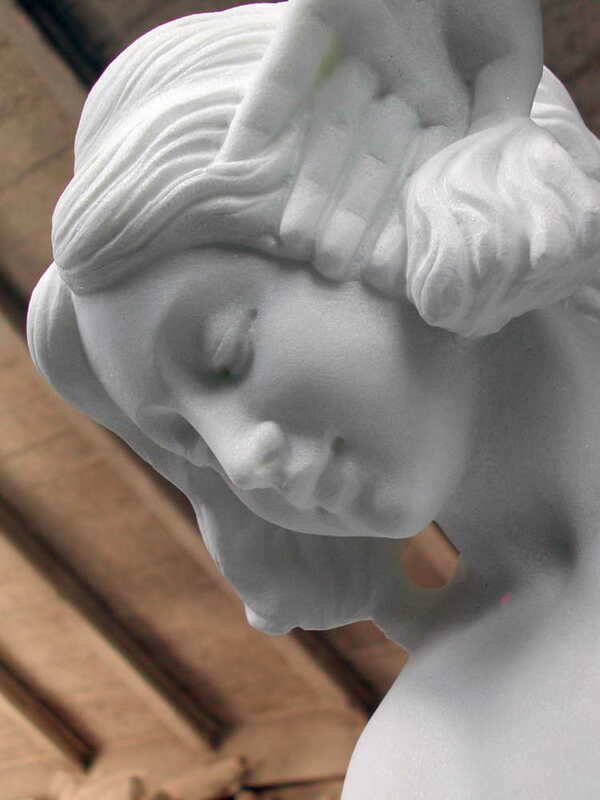 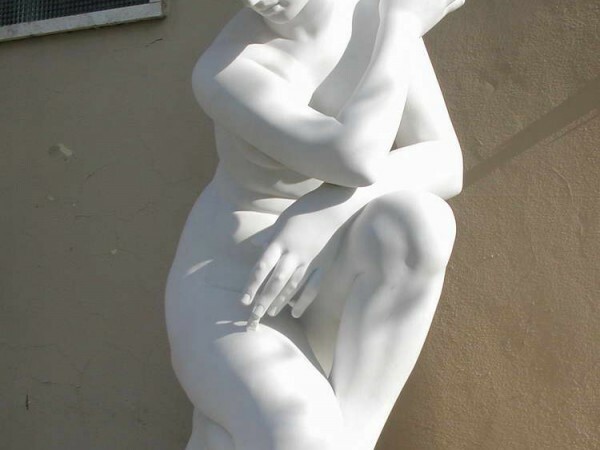 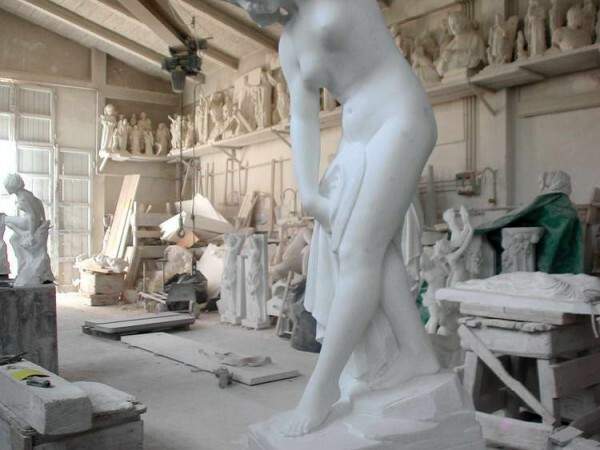 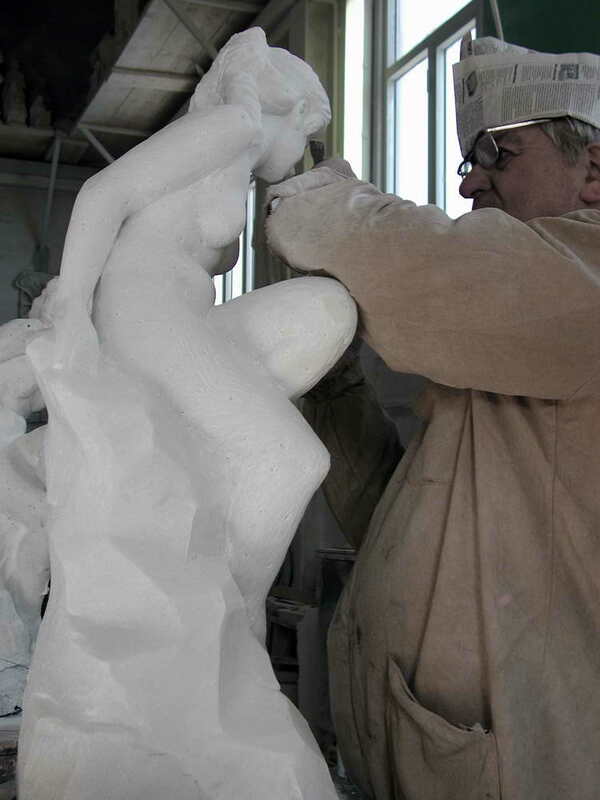 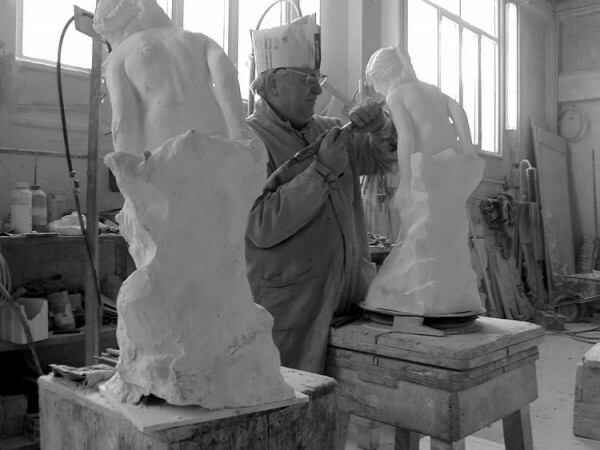 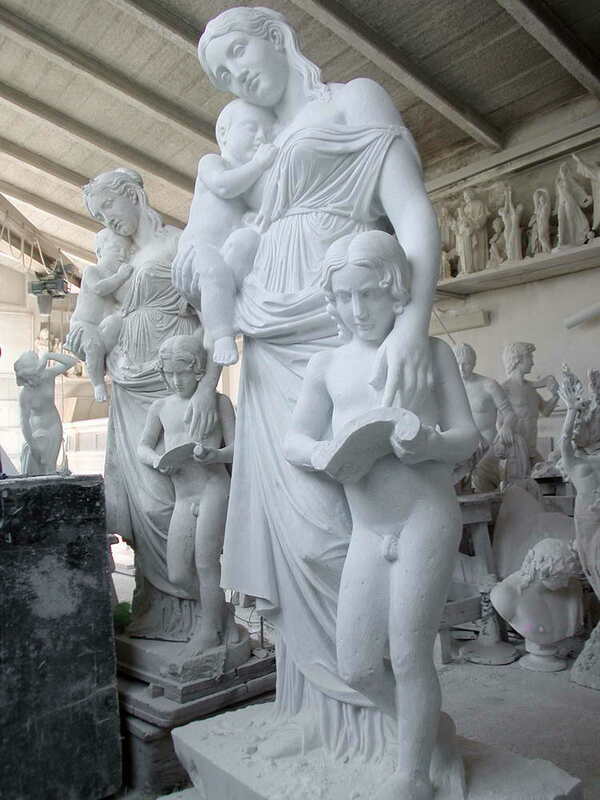 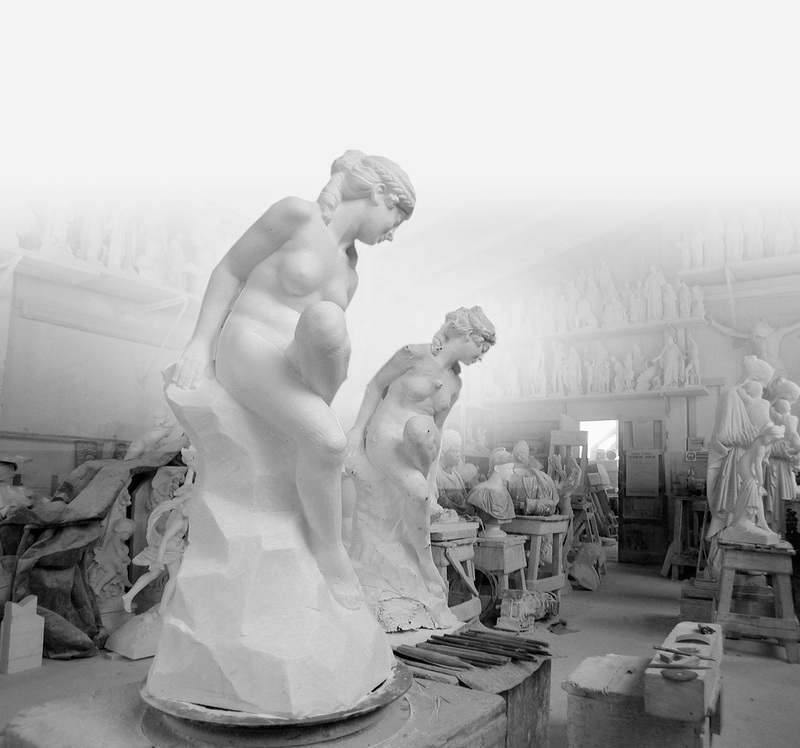 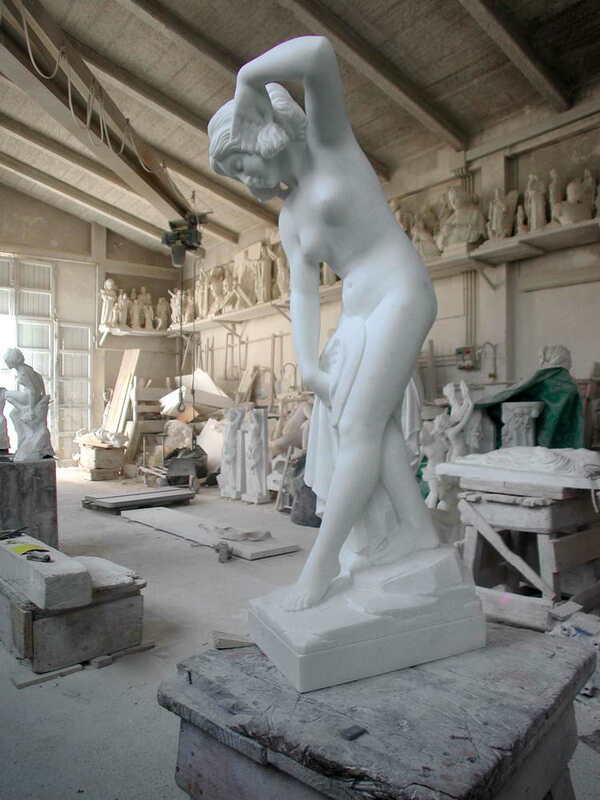 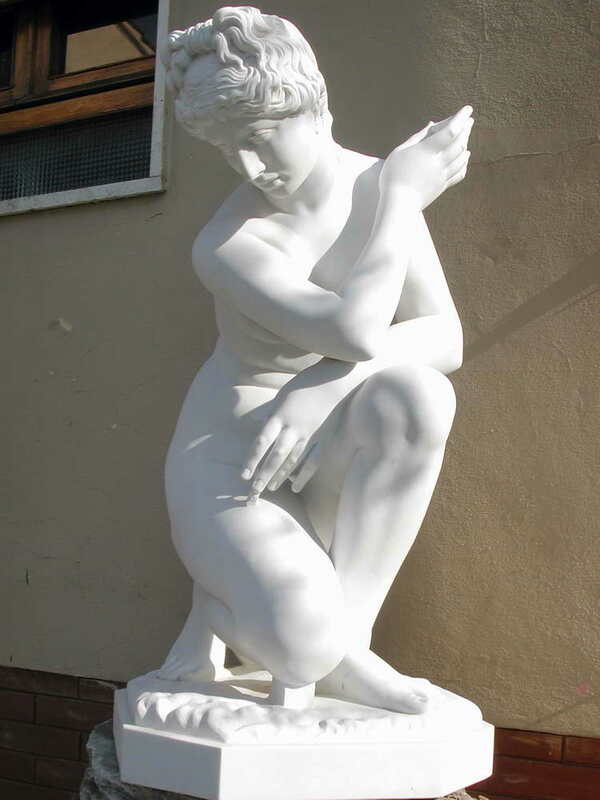 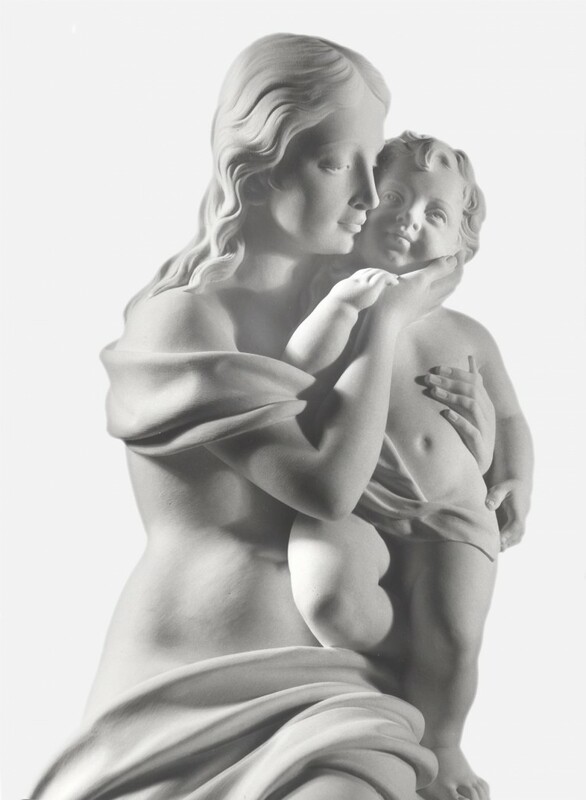 The workshop is equipped to produce classical works of any size, both from drawings and models. 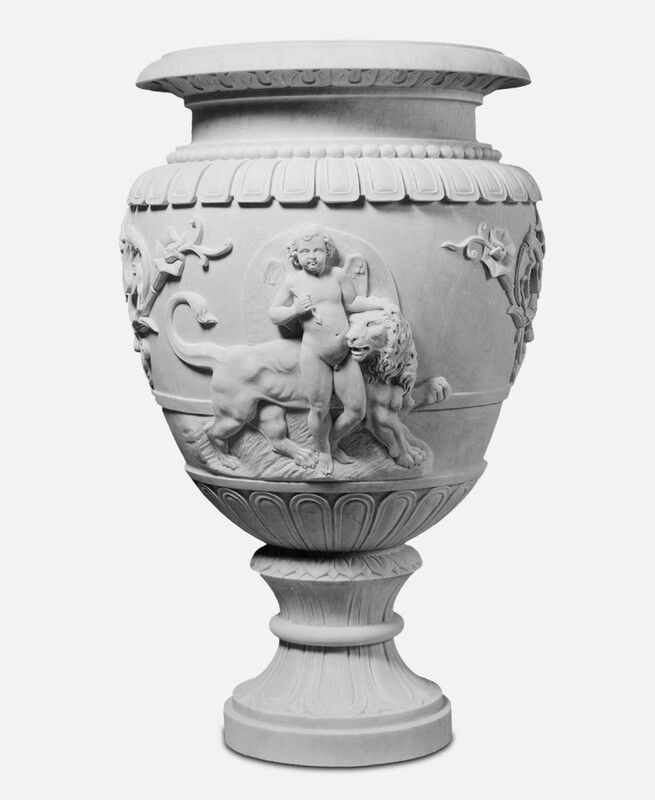 Bas-reliefs, busts and sculpture in the round, animals, architectural accessories such as capitals, decorative friezes, benches, elements of religious architecture such as pulpits, altars, tabernacles and architectural items for public buildings, places of worship and mosques. 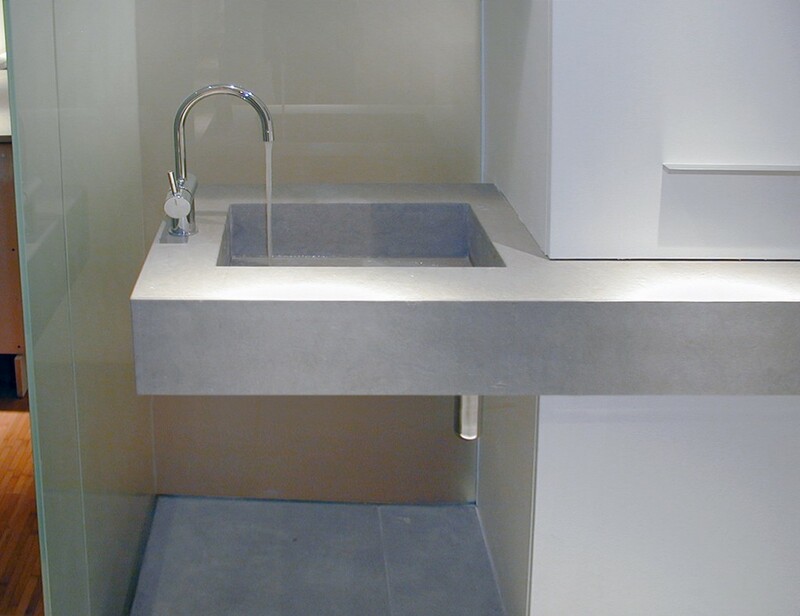 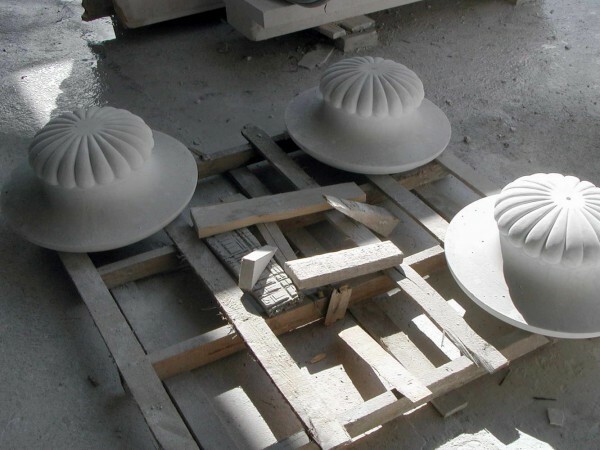 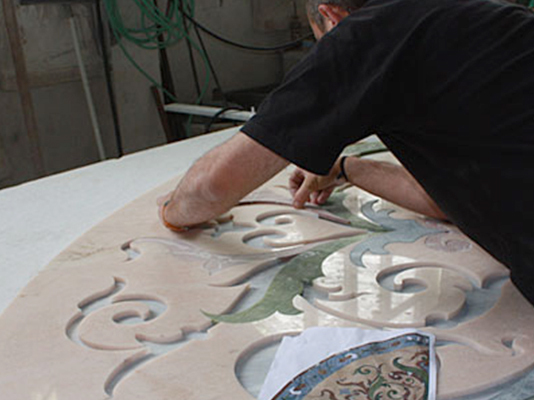 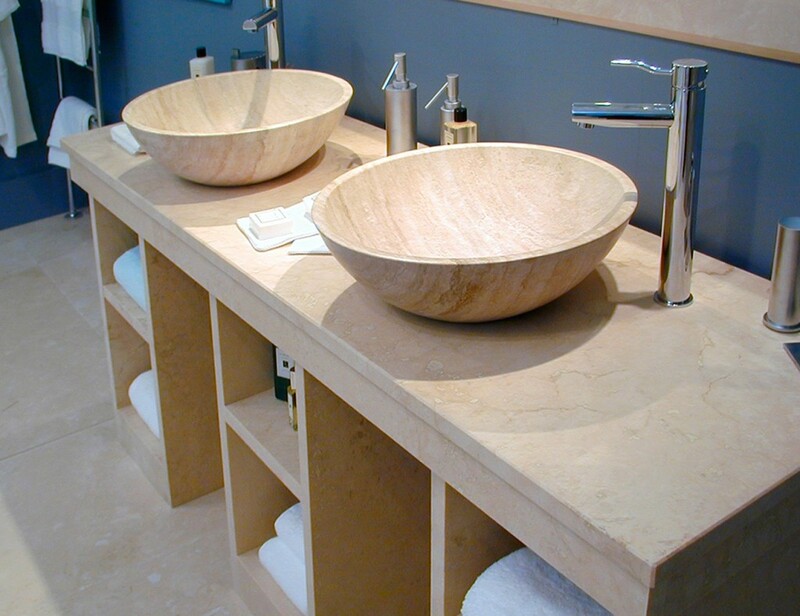 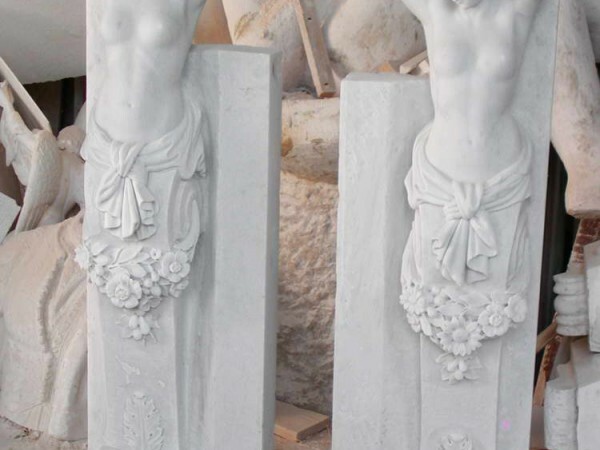 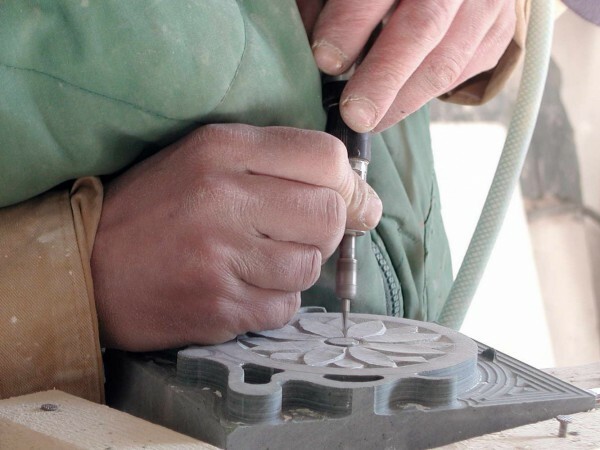 When brothers Enrico and Mauro Galeotti took over from their father Luciano, workshop production was expanded at all levels and in all fields of natural stone use, while maintaining their own artistic identity and high quality performance in executing any type of project. 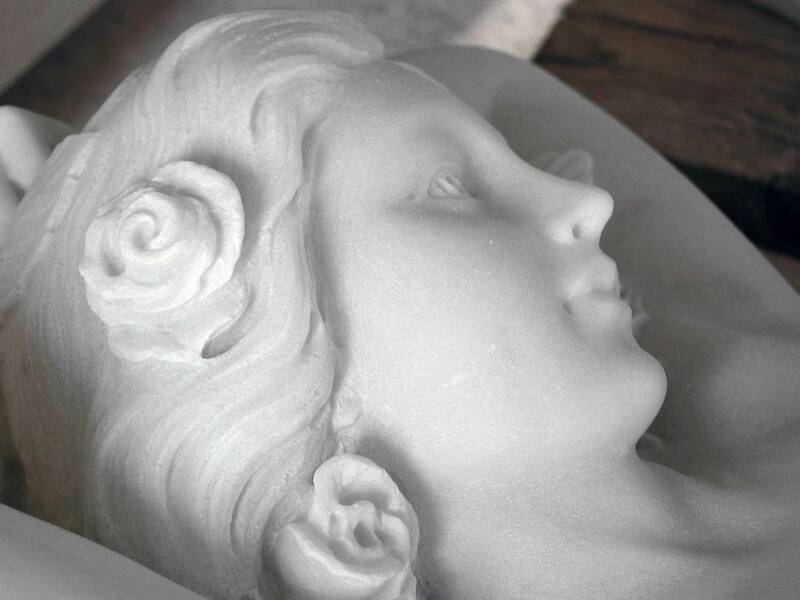 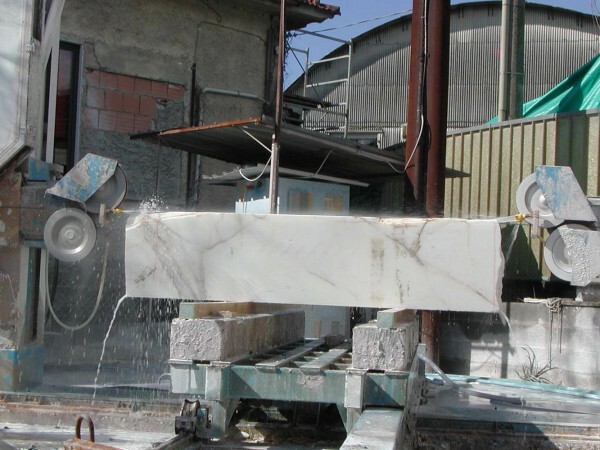 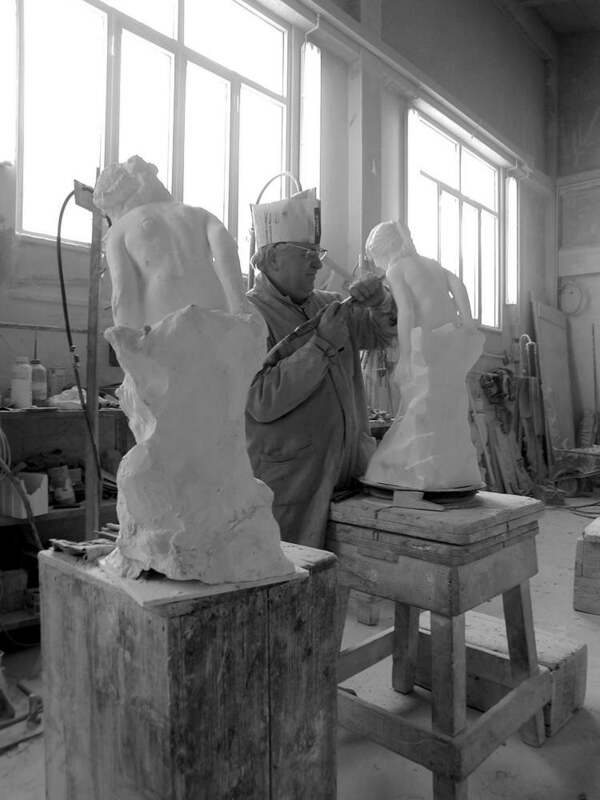 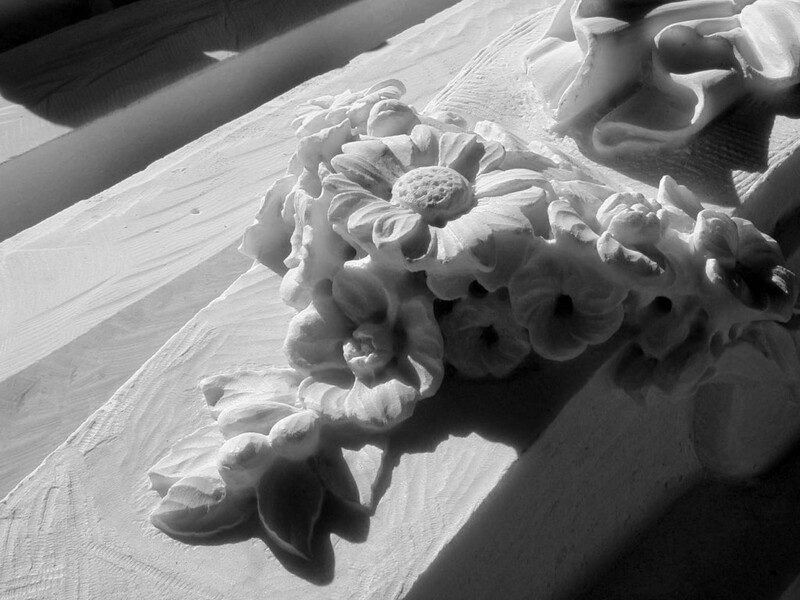 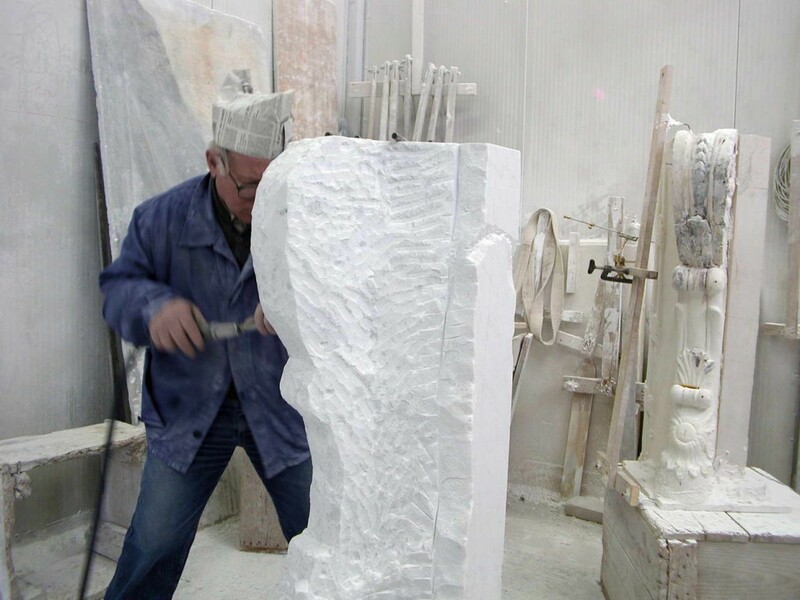 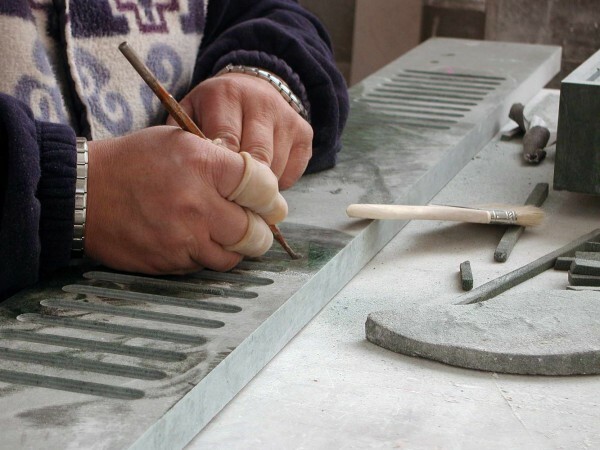 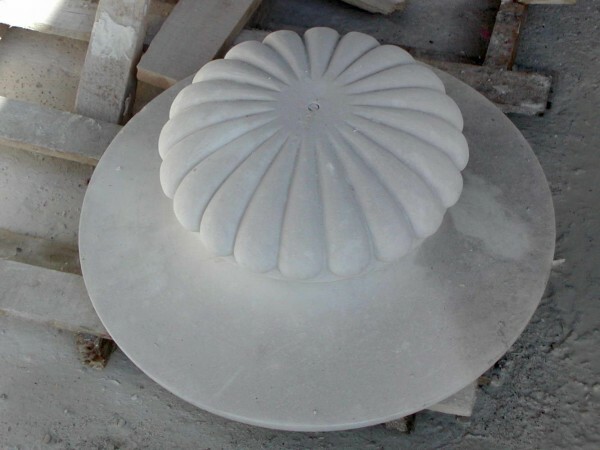 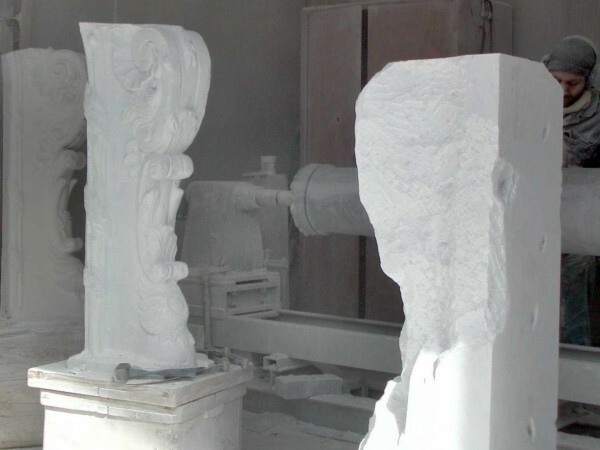 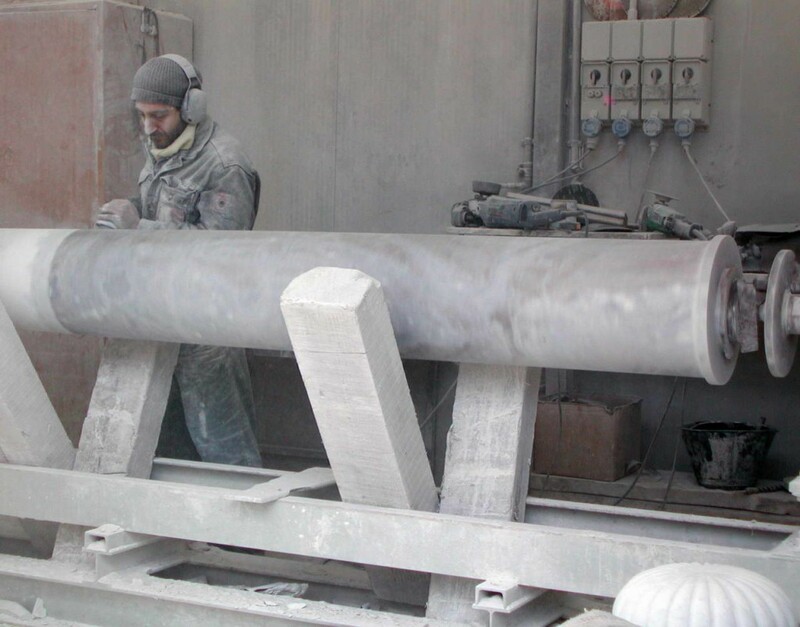 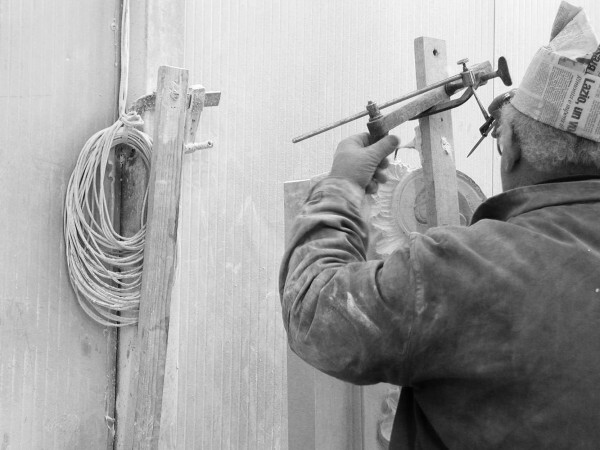 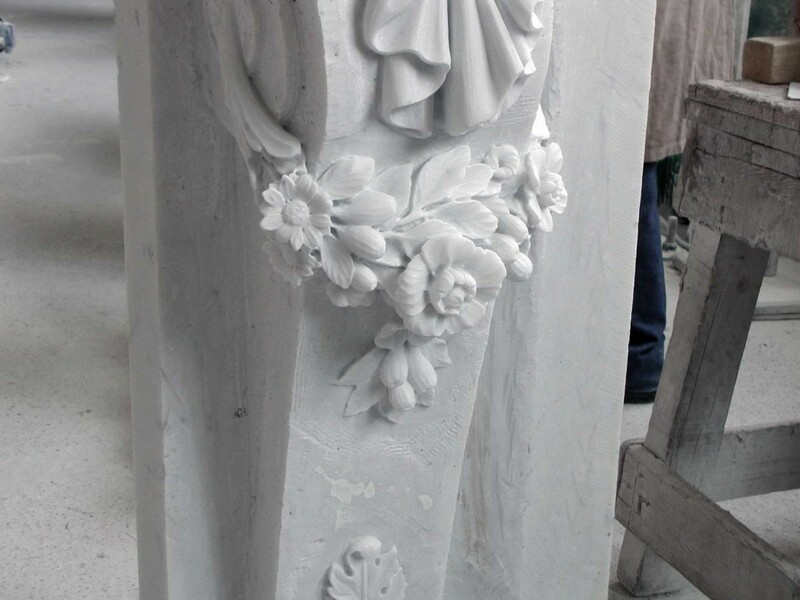 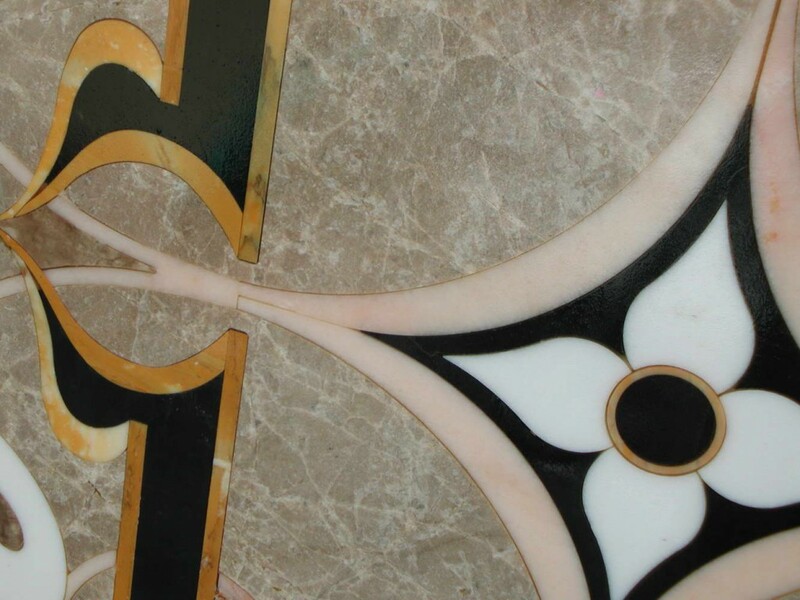 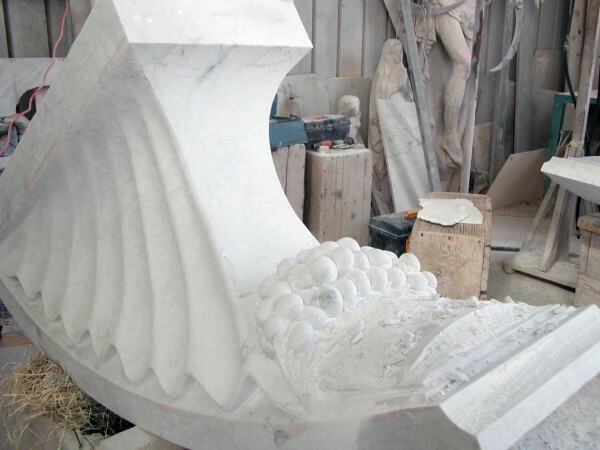 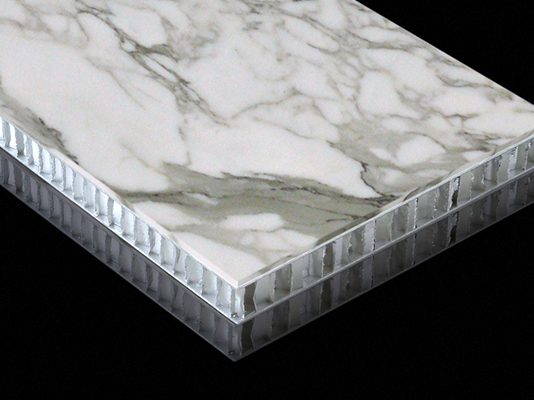 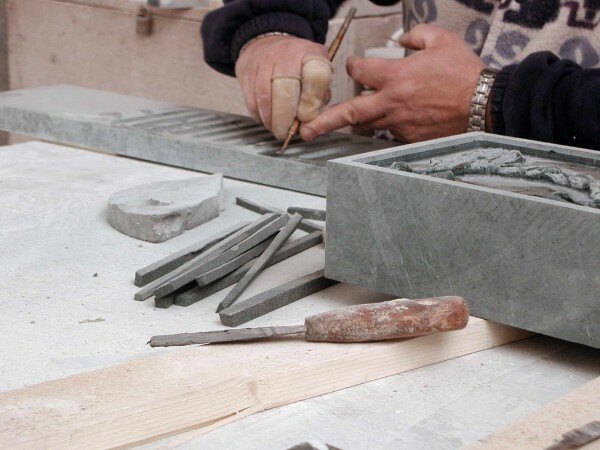 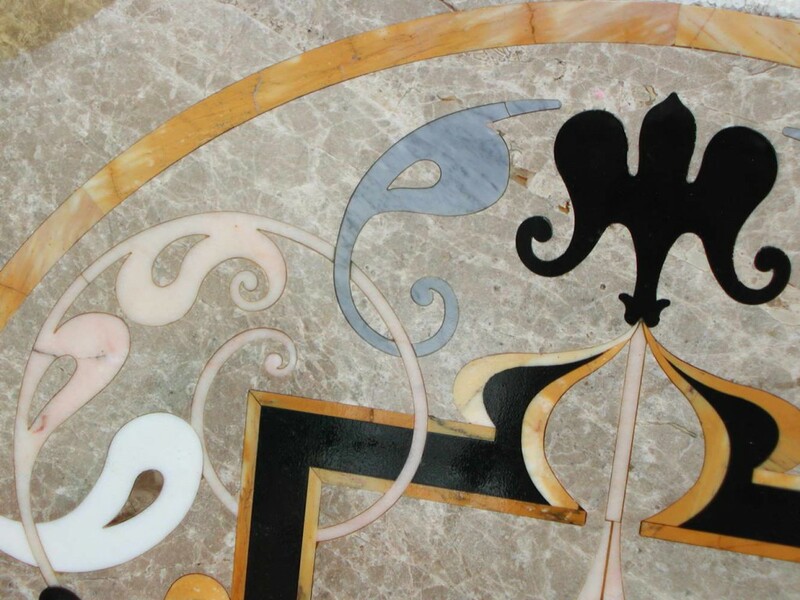 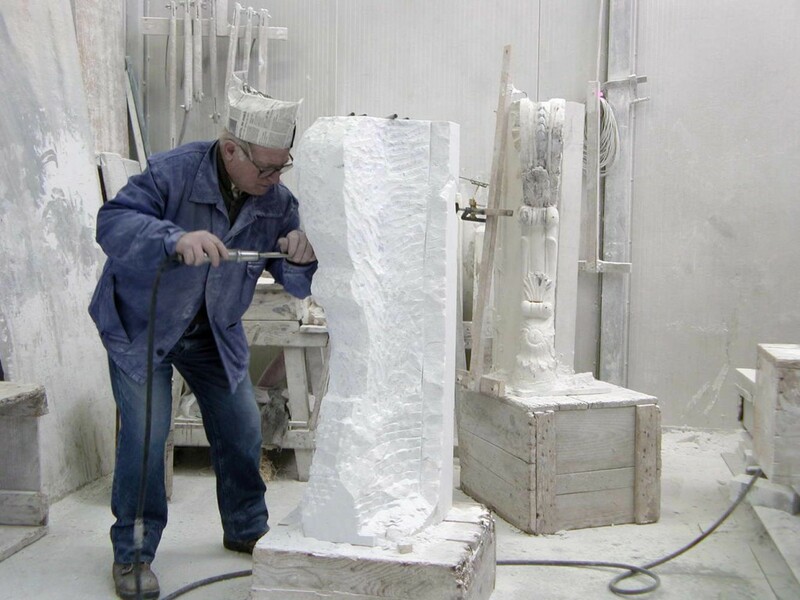 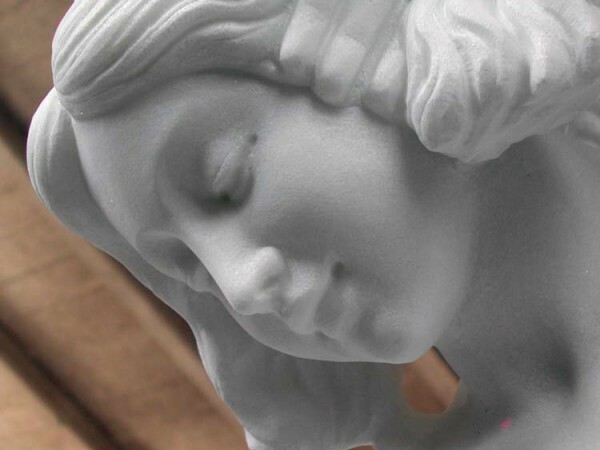 Motivated by youth and with a fresh approach to knowledge, Enrico and Mauro acquired specific skills in new methods of working marble and other stone materials. 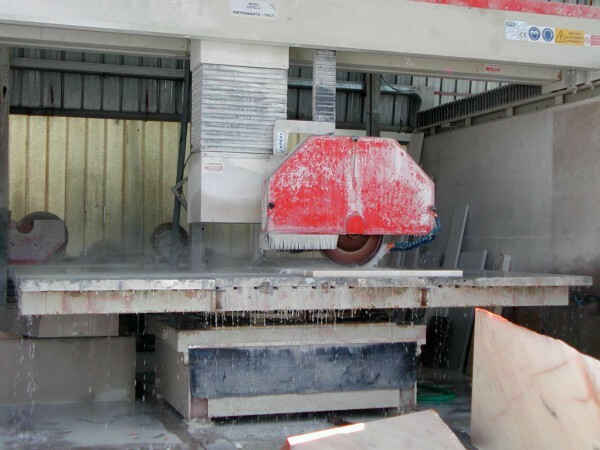 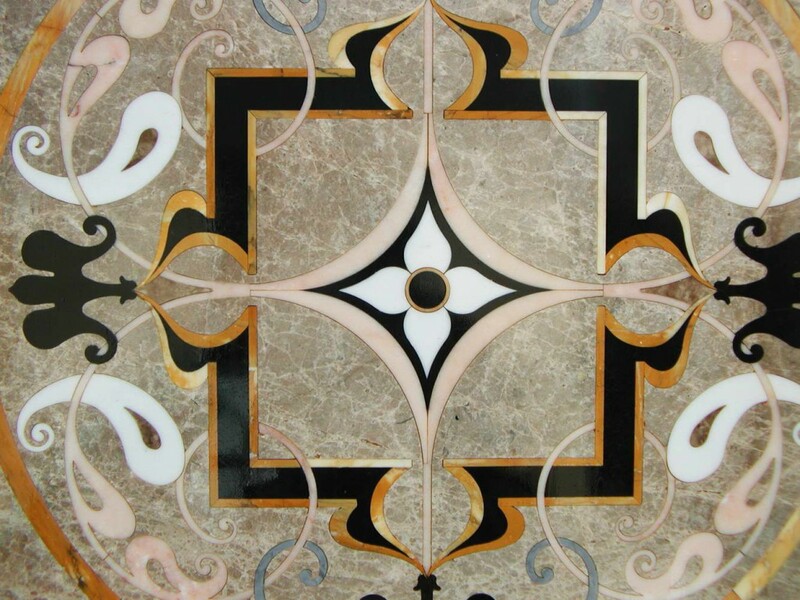 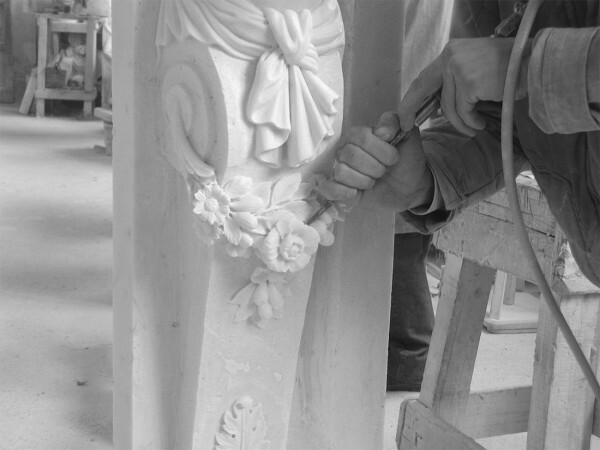 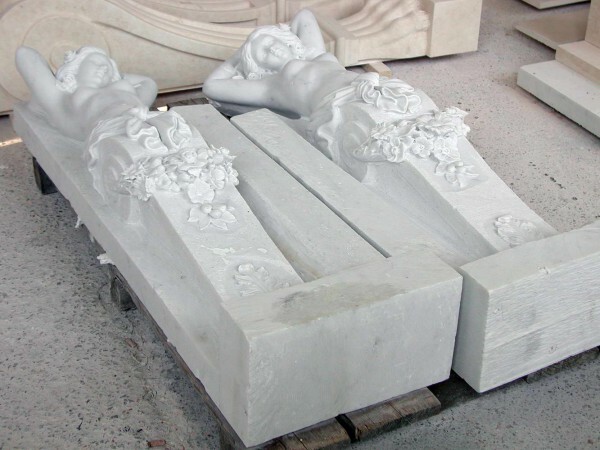 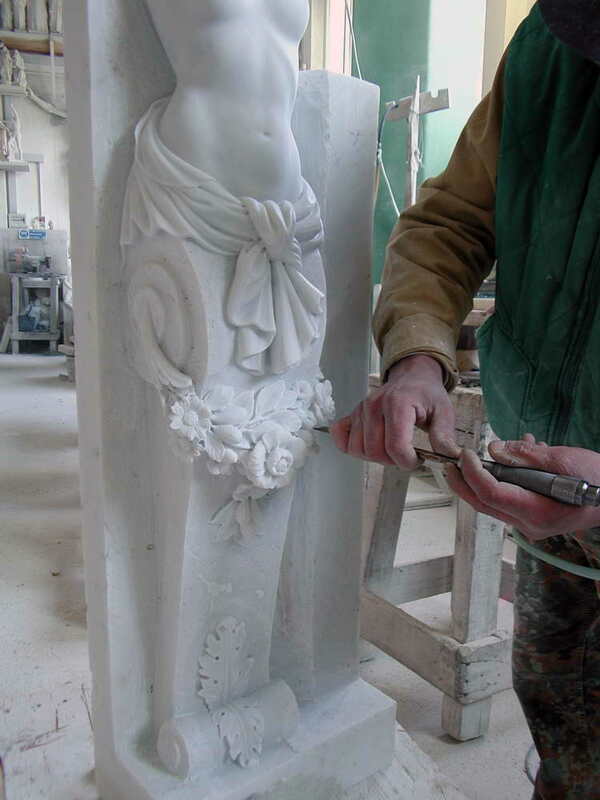 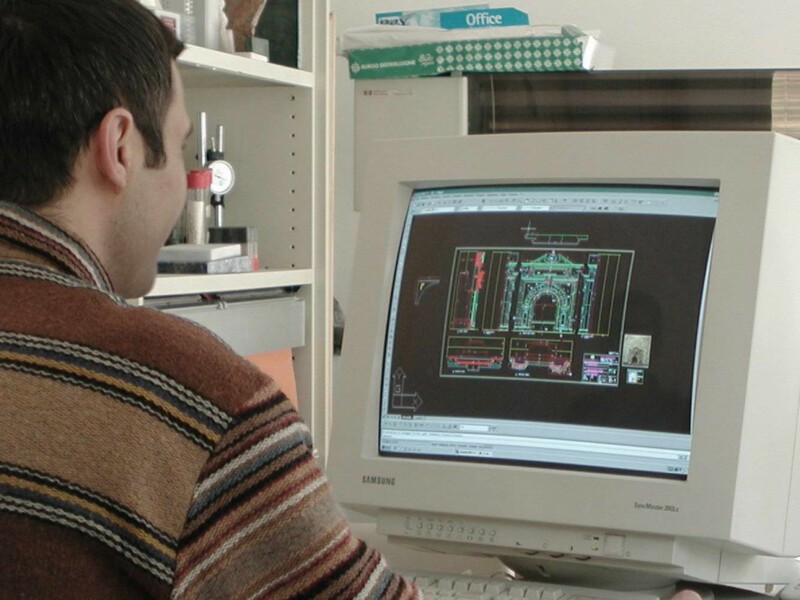 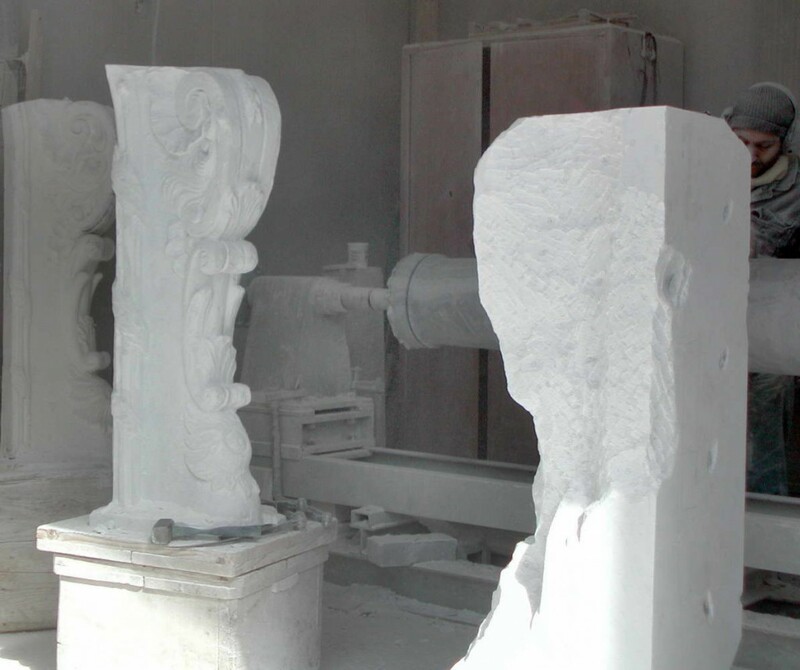 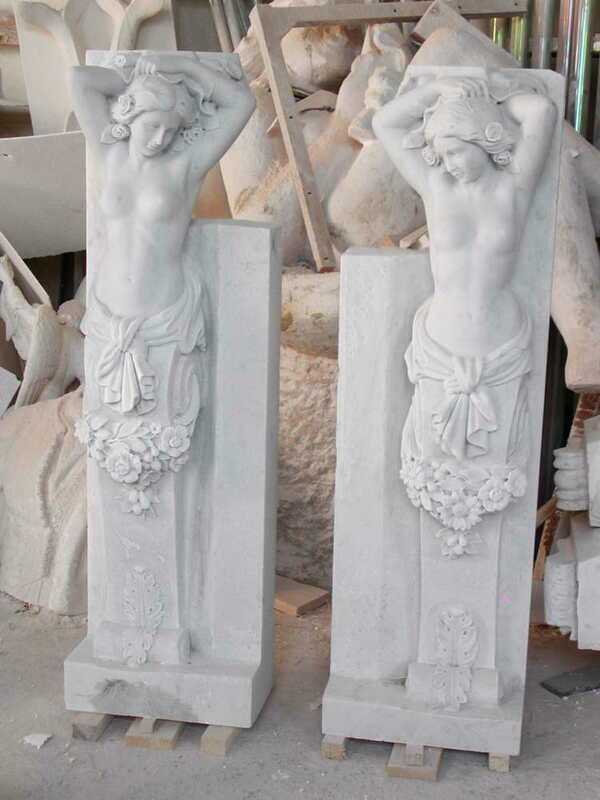 They brought new stimulus to the workshop by purchasing CNC machinery to carry out prestige projects in classical and contemporary styles, and for special processing such as cutting stone blocks to produce solid marble items (bathtubs, basins, low relief creative cladding, altars, etc) and waterjet cutting to make magnificent inlays and splendid decorative work for flooring and wall cladding. 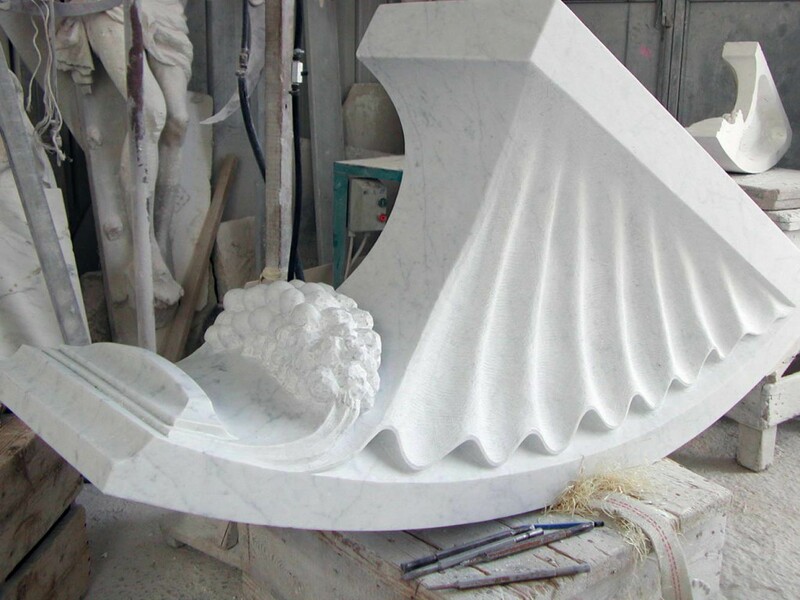 Particularly drawn to innovation and conscious of the need to broaden their range of services by offering products specifically for contemporary architecture and design, the workshop has studied the many aspects of lightweight marble applications in-depth, both using honeycomb support structures and experimenting new systems, in order to achieve lightweight stone panels with a thickness, either flat or curved, no greater than 5 mm. This particular technology has opened up new prospects for all those applications where the weight of the material and its thickness are fundamental to the feasibility of a project.